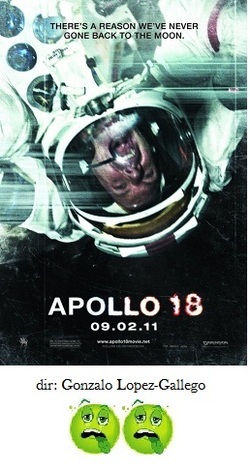 Apollo 18 offers an interesting twist on the now-cliched 'found footage' movie, the genre that broke into the mainstream in 1999 with The Blair Witch Project and has been the basis of such films as Cloverfield and the Paranormal Activity series. Unfortunately, the idea behind Apollo 18 is much better than the end result. The basis for the plot revolves around a heretofore unknown mission to the moon that ended in disaster. Until now, we only believed that Apollo 17 was the last one. The footage here posits that a three-man crew went up to explore the dark side of the moon, all of which was cobbled together from cameras from inside the cockpit, the lander and the astronauts' helmet cams. The beginning passages of Apollo 18 do a good job in generating an ominous sense of doom, but it becomes clear that by adhering to the 'found footage' theme, the visual style was going to be extremely limiting. There are only so many ways to film the tight confines of the cockpit control room before the redundancy and the annoying use of a fish-eye lens becomes tedious. Also adding to the problem are the shots out on the moon itself. I'm sure budget constraints hampered the ability to provide some terrific special effects, therefore there just isn't any sense of wonder or grandeur about being on the moon. So what exactly happens to these poor doomed dudes? Let's just say that, unless there are audience members who suffer from some sort of debilitating fear of rocks, the menace is completely underwhelming. Once we are privy to this silly explanation for the how and the why behind the demise of the mission, there just isn't anything else of interest. We just wait until they all perish (slowly, I might add) and the movie is over. Unlike the shrinking horror of the final images of The Blair Witch Project or the exhausted defeat of Cloverfield, Apollo 18 doesn't leave you with anything when the credits roll except the need to shrug. The only function it serves is as a way to kill 90 minutes without too much suffering.